Most people think of a landscape that has many types of plants, including herbs and other edibles, when they picture an English Cottage Garden. In your mind, you can almost see the butterflies flitting and hear the bees buzzing. It’s the kind of garden you would love to recreate for yourself. Everyone’s yard has different shapes and dimensions, but you can design an English Cottage Garden, to fit your needs, by knowing what to include in your plan. Begin with a list of the items you would like to incorporate into your garden and then create a simple placement map. Choose flowers and plants for your English Cottage Garden. Roses are almost always found in English cottage gardens. Choose between climbing roses, on a trellis, or bushes. Other classic plants included in this type of garden are: grannies bonnets, catmint, delphiniums, foxglove, geraniums, lady’s mantle, lavender, peonies and sweetpeas. Choose edibles for your English cottage garden. Herbs of any type can be included within the landscape or as a separate smaller aspect of the garden. Strawberries, blackberries, tomatoes, green peppers and fruit trees are all good choices mingled within your cottage garden. Create seating areas. English cottage garden designs are known for inviting benches and other seating within the landscape. Whether it’s made from wood, concrete or metal, it should have some artistic value to it’s features. 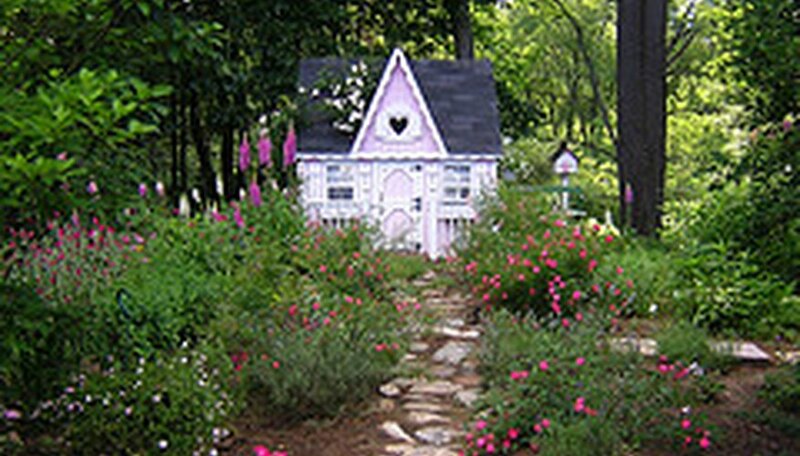 Put focal points in your design, such as ponds, birdhouses, birdbaths, sculptures or garden art. Put plants in pots, throughout the garden, for added design features. There are always many interesting things to look at in an English garden. Begin a pathway or entrance with an arbor. The height variation adds another point of interest, in your design, and a place for a climbing plant, such as roses, morning glories or clematis. Walk down pathways you’ve designed in your English garden. You certainly can create pathways, simply, with gravel. However, other options are available, such as brick pavers, flagstone or even grass.